Have you ever been to the Caribbean? I spent a month there for a music class in January of 2012. It was one of the most incredible months of my life. I was mainly in Trinidad, a small island that happens to be the birthplace of calypso, steel pan, and an incredible pop genre called soca. Trinidad has two main popular forms of music: steel pan orchestras and soca music. The steel pan was invented in Trinidad after a long process of trying to find a musical form that was accessible to all and that early colonizers would allow Trinidadians to play. Although steel pan is awesome, I find soca more intriguing as a vocalist. Soca music is frequently referred to as the child of calypso, which was once the most popular vocal form of expression in Trinidad. Calypso lyrics discussed political topics and were often witty. Now, with the emergence of soca, the political edge is gone. Soca is more about dance, rhythm (or riddim) and “feteing” (partying). One of the most intriguing characteristics of soca music is its creativity and collaboration. Soca music is built on a background beat called a “riddim.” Essentially, the same chords and rhythmic structure back multiple songs, and each unique back track is called a riddim. In the video above, featuring soca superstar Machel Montano’s “Vibes Cyah Done,” the Antilles riddim produced by Precision Productions backs his original melody. [Sidenote: I got to meet Machel Mantano, above, and another popular soca artist, Kerwin Dubois, at the ASCAP expo this year. I screamed like a little girl. It was embarrassing.] This same riddim in used in many other songs, including the popular “Bacchanalist” by Kerwin DuBois. “Bacchanalist” hails back to the cleverness of calypso lyrics in its title and message. The term “bacchanalist” is derived from the Roman god Bacchus, who was the god of wine and ecstatic celebrations. In Trinidad, to say you are a “bacchanalist” is to compare your enjoyment of life and partying to that of Bacchus. There is also a non-literal “house of bacchanal” mentioned in the lyrics, which serves as a unifier for all the bacchanalists. Both of the above soca tunes were produced for Carnival 2012. Each year, Trinidad has Carnival on the week before Fat Tuesday. This celebration is similar to Mardi Gras. It is intrinsically tied to music in Trinidad. Carnival includes competitions for steel orchestras, soca artists and the remaining calypsonians. Overall, soca music is exciting, entertaining and danceable. If you want to listen to more soca, I suggest you check out Island Mix’s list of Trinidadian soca music. I’ll leave you with a personal favorite, “Make Yuh Rock” by Machel Montano. 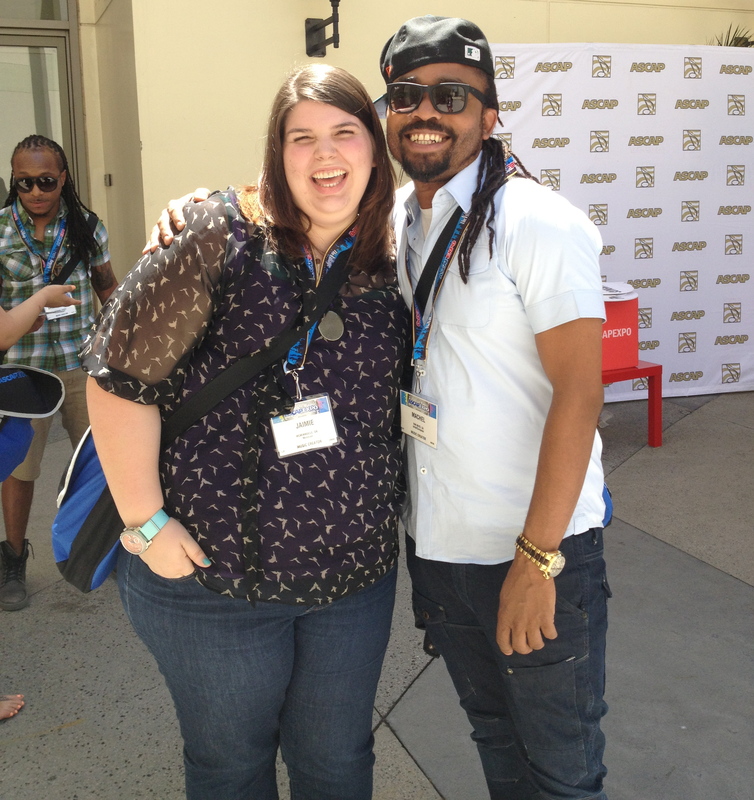 Featured photo is of Machel Montano and me at the ASCAP expo. Seriously. Fan girl screams. 29 Apr	This entry was published on April 29, 2013 at 10:09 PM. It’s filed under ASCAP Expo, Music, New Music Mondays and tagged entertainment, music, soca artist, trinidad calypso. Bookmark the permalink. Follow any comments here with the RSS feed for this post.